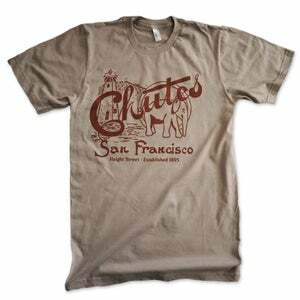 Thought I’d share a fun, and not too well known (at least not yet) site that features some AWESOME San Francisco T-shirts. The site is www.gangsofsanfrancisco.com and their shirts rock! Gangs of San Francisco is a one man operation out of San Francisco’s Outer Richmond. A work in progress, it is run by me, Laureano Faedi. A self taught maker of things, I do all the design work, silkscreening, shipping and research. Having migrated to the Bay Area from Buenos Aires 30 years ago I have found San Francisco to be one of the best cities in the world to live in. This project serves as an outlet for my learning of it’s history as well as a way to teach myself silkscreening. I hope that not only will people enjoy my products but that it might also inspire them to learn more about the city. His collection is a great start, but I’d LOVE to see more! Let’s not forget about the various racetracks in the City, the brothels (oh yeah, we had those), the cemetaries (all over the west side of SF until they were moved out to Colma) and even old sports teams like the San Francisco Seals!